The FBH36 Fiberglass Bar-Height Patio Table is perfect for use at a pool bar, on a balcony, or anywhere a high patio table is required. The FBH36 Fiberglass Bar-Height Patio Table has an extruded aluminum base that may be powder-coated in any of the available frame finishes and the fiberglass top can be ordered to match. 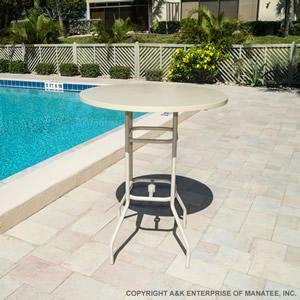 The 36" round tabletop is the perfect size for 2 or 4 people and the top may be ordered with or without an umbrella hole.